Home Ministry Leaders REVIEW: Starting Small by Ben Reed … Just Added This to My Top 3! REVIEW: Starting Small by Ben Reed … Just Added This to My Top 3! I just counted them … 90. In my office I have 90 books written about leading small groups. I just read Ben Reed’s new book on how to put together a small group system in your church. It’s titled, Starting Small: The Ultimate Small Group Blueprint. Now why would Ben, or anyone else for that matter, write another book on the subject? And why should you read it? Easy to read. At just 52 pages, I read the whole thing in one sitting … and loved it! Fun. This is not some dry, same old, same old, content. Ben is a funny guy and it comes out in this book. He shares his personal stories, so it’s kind of like a travelogue as you go along with Ben as he has learned how to build and grow a healthy small group ministry himself. Practical. There is very little theory in this book. Instead, Ben provides very practical steps you can take in your ministry. He also gives us lots of useful lists, which is a great way to share practical information! Accommodating. Ben doesn’t just give some one-size-fits-all, our-church’s-way-is-the-only-way philosophy. He provides lots of great options as you make decisions about your group strategies. He says, “Can I share something with you? There is no magic bullet. No secret pill you can give group leaders. No one-stop-shop for your small group health needs” (p. 38). That’s true. Strategic. As you read this book, you’ll be able to develop your own strategies that will work in your own church environment. One of my favorite strategies Ben discusses is the Test Group idea in Chapter 3. Thought- and Action-Provoking. This book will help you think through how to (or how to better) organize and develop your small group ministry, but it is also written to help you take action right away. The questions at the end of each chapter will help you take the chapter’s contents and do something strategic with it. Health-Conscious. That tag may sound funny, but one thing I noticed through the book is Ben’s focus on the health of small groups. As I’ve said over and over, healthy things grow and reproduce themselves; therefore, focus on the health of your group(s) and you’ll see the growth and multiplication you desire (see my book Small Group Vital Signs). Ben understands the vitality of healthy leaders and healthy groups. 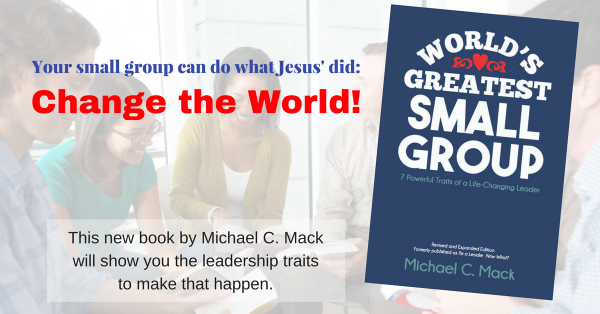 You don’t need to go out and buy 91 small group books to develop a healthy, strong, growing system of small groups. (Most of them fail the test of my 7 factors above, anyway!) I just added Starting Small to my list of 3-5 books I recommend to every small group ministry leader I coach and church I consult with. By the way, I want to share my favorite line in the book. Ben talks about his #1 marker or sign of a successful small group: “When we say ‘Amen,’ we’re not done” (p. 39). He said he and his wife knew his group was doing well when the official group meeting started at 6:30 and people were still hanging out until 11:00. I agree! Small groups are about relationships and how God uses them to bring about transformation in our lives. And that is no small deal! Find out more about or buy this book on Amazon. to be on mission together through small groups. small groups can be a place where people belong so they can become.! Why Didn’t You Warn Me?